Winner of the 2004 Bloody Dagger Award! 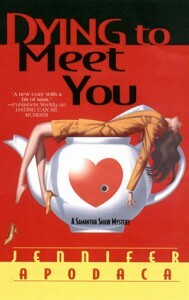 Samantha Shaw-irrepressible owner of the Heart Mates dating service-knows love can be tough. Even tougher is turning up at the home of her ex-client, Faye Miller, just in time to find Faye’s body. The scene gets worse when arrogant detective Logan Vance arrives, the newspapers connect Heart Mates with the murder…and Sam’s own bad boy amor, P.I. Gabe Pulizzi, tries to muscle in on the action. In between dodging assassination attempts and tangling with detective Vance, Sam needs to find a led she can run with, before her remaining clients run scared and Sam loses her business, her boyfriend- and maybe her life.